The first step in restoring the column finish was to apply a thick lime plaster stucco to the columns, and traditional trowels and hawks were used to apply the lime-based render to the shaft of the columns. However, the complex moldings found on the capitals and bases required a different tool called a horse. A horse, which is a custom-made wooden frame that holds a piece of sheet metal cut into the shape of the molding profile, is slowly worked around the circumference of the bases and capitals to form the molding. At the end of the process the whole surface of the column is smooth and, when seen from a distance, the columns can appear to be made out of tan colored sandstone. There has been some evidence found at other historic sites from the same period, such as Jefferson’s Poplar Forest, that columns were occasionally left with the tan-colored render exposed. One theory holds that these columns were left unwhitewashed in order to give them the appearance of being made of sandstone. 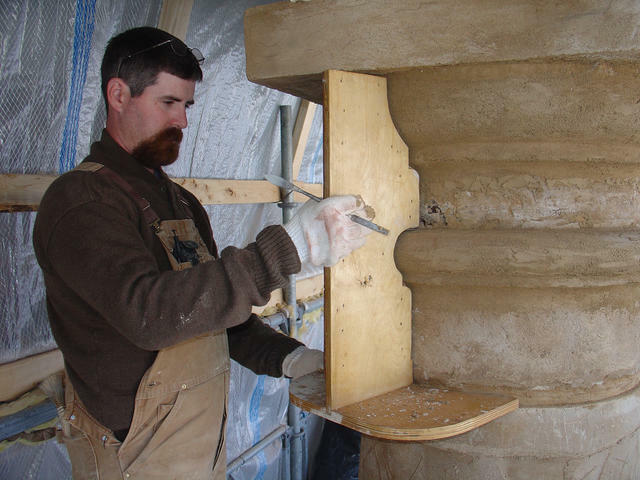 Restoration mason Wayne Mays uses a horse to sculpt the stucco applied to the column's capitals.